This is the final entry in the journal series covering the second Rosetta Launch Campaign, which ran from October 2003 until just after launch in March 2004. This journal series covered the main activities during the last few months leading up to launch: from the start of the second Launch Campaign in October 2003, through the final integration of the spacecraft with the launcher, to the launch on 2 March 2004. The first Rosetta launch campaign ran from September until December 2002 in anticipation of the original launch date in January 2003. That launch was postponed until 26 February 2004 due to issues with the launch vehicle. Although Rosetta left the launch pad some 60 hours ago, telemetry is still being received in Kourou. This is because the DIANE Ground Station, located a few kilometers from the launch pad, has been heavily involved in the early operations of Rosetta whenever the spacecraft has been within range. 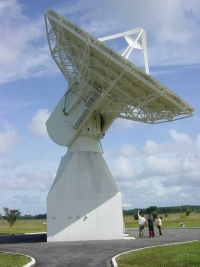 The picture showing the antenna while it is communicating with Rosetta, was taken a few hours before the end of the last 12 hour contact period with the spacecraft from Kourou. At the time Rosetta was about 810 000 km away from the Earth. Communication will in the future be handled by the New Norica Ground Station in Australia.